For those of you have been so faithful to read this blog, thanks for being with us! This is going to be my last and final post, but no worries! We'll see you at the brand new "John" website in a brand new blog. Call it version 2.0, coming very, very, very soon....!!! Here is a mock up of the new site they're doing for us. It won't look exactly like this, but it will give you a rough idea of what it's going to look like. I know you've been keeping this whole process in prayer. Please continue to do so as we keep working on the new site that will facilitate in creating greater awareness about the soul-winning project that is the film, The Gospel According to John. My heart is filled with anticipation...i am pregnant with the hope and anticipation of what God will (and is) doing. JOHN truly is being borne and birthed through the prayers of the saints. Lord, let the window open! Lord, let the dam break! Lord, you are the one who provides seed to the sower. Let your people sow -- not into a "Christian movie" -- though important and precious -- but, rather into the birthing of souls!!! 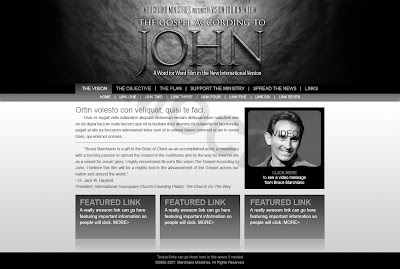 In developing the new JOHN website, we are getting closer. One thing i'm anticipating will happen is the new Discussion Board feature. This will allow the saints to communicate and pray for one another regards to JOHN in a more effective way. So far we have been only been able to use the Comment feature every time I post a new blog entry. But the Discussion Board is going to take off! And God knows where he wants to take that! I just received words of deep encouragement from a fellow commenter through our blog. There is really no way for me to personally respond in the blog forum, so suffice it to say that I am going through some stuff right now in my personal life and those words just confirmed the faith that I had about the goodness of God and his heart toward me. Saints, let me share my testimony. I hope it encourages you as you walk the adventure that is life in the Kingdom with our God who is (as the late Rich Mullins has described him) "a wild man." God is shifting -- as tectonic plates -- the ground under my feet, transitioning me and "catapulting me into new dimensions of ministry and life." When you're on God's catapult, the first part is CONFUSING. What's going on? The questions run through you as you feel as though you are sinking and being tied down onto that catapult. Then you are sprung into the air and at the apogee -- the height of your free-flight -- it is the most TERRIFYING because you are no longer soaring, but you are realizing you're about to plummet to the ground and death is looming into view. But as the ground comes up closer you realize you will SOON TOUCH DOWN SOFTLY onto "green pastures" that the Great Shepherd has provided. So I'm at that apogee and fear is giving way to hope and hope to assurance that "all things work together for good to them that love God who are the called according to his purpose"(Rom. 8.28). Meanwhile, work on the new website continues in God's grace! Hi, my name is Ronald. I'm working alongside Bruce Marchiano to bring "The Gospel According To John" to film. Bruce has asked me to author this blog--this journal of the making of "John." Welcome!